Glamis Castle in Scotland is probably best known today as the childhood home of Elizabeth Bowes-Lyon, late mother of the current British monarch, Queen Elizabeth II. Although a castle has only been here since the 14th century, the site of Glamis has a history which goes back much further, so far in fact that it mixes with legend and myth in the form of associations with Shakespeare’s MacBeth (In 1034 King Malcolm II was murdered at Glamis). The family chapel is said to be haunted by a Grey Lady, the spirit of Lady Janet Douglas, who was burned at the stake as a witch on Castle Hill, Edinburgh in 1537, on charges of plotting to poison the King. The ghost of a woman with no tongue is said to haunt the grounds, and to look out from a barred window somewhere within the castle. The restless spirit of the licentious Earl Beardie, who was rumoured to have gambled with the Devil in life, is said to wander the castle, and there have been reports of children waking to find the figure leaning over their beds. In this long and lurid history, filled with tales of murder, treason and black magic, no account is as chilling as the story of a secret room somewhere within the castle that harbours a dreadful secret: The Beast of Glamis Castle. The secret room has many tales as to its origin; the most popular is that it holds a monster, sometimes called the Horror of Glamis. In 1821 the first son of the eleventh Earl, Thomas Bowes-Lyons, was said to have been born horribly malformed. To hide this fact, the story was circulated that Thomas had died but a widespread belief persisted that the infant was actually locked up in a secret room within the castle. The legend of the boy’s survival appears to have started in local villages as the result of an account by the midwife that the deformed child had been in rude health when she left, causing suspicion when his death was announced a day or two later. The child Thomas had no gravestone, a matter which seemed to support the initial rumours. Much of the available information about the so-called ‘Monster of Glamis’ comes from James Wentworth Day’s The Queen Mother’s Family Story, published in 1967. 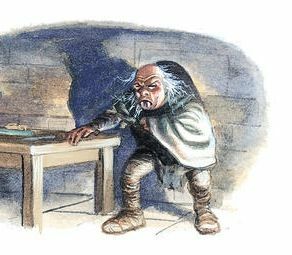 This gave details of Thomas’s distorted appearance: “His chest [was] an enormous barrel, hairy as a doormat, his head ran straight into his shoulders and his arms and legs were toylike” and told of how he was fed daily through an iron grille in his cell door by one trusted servant. It was even claimed that Thomas was occasionally exercised by being taken for a walk, like a dog, on the battlements on moonless nights, earning a section of the castle the name of ‘Mad Earl’s Walk’. A supernatural element creeps into the tale when Thomas is described as more beast than man and is said to be immortal. There are records of encounters with the Monster of Glamis in the 20th century, long after Thomas should have died. On each occasion the same thing happens – the individual concerned is bribed into silence by the castle’s rich and influential owners. It is difficult to determine whether the ‘Monster’ is factual or not. Perhaps the truth is nothing to do with monsters or werewolves but simply that there was once a sad, lonely child segregated from his family for no other reason than the way he looked. It is difficult to discount the supernatural element of the tale completely, however, when one visits the brooding castle and hears the many other ghost stories surrounding it. In particular, according to legend the castle is said to be as haunted as it is because of an ancient curse brought on the family by Sir John Lyon, who removed an ancestral chalice belonging to another family from their seat at Forteviot, where it was supposed to reside for ever. Until it is returned, perhaps the rumours of spectres, curses and a Monster at Glamis will persist. In the next year or two, my husband and I will be visiting Europe. Have you considered creating a guide to clusters of places that could be visited? Perhaps by gathering these profiles into geographical groupings … just a thought. An intriguing idea… watch this space!